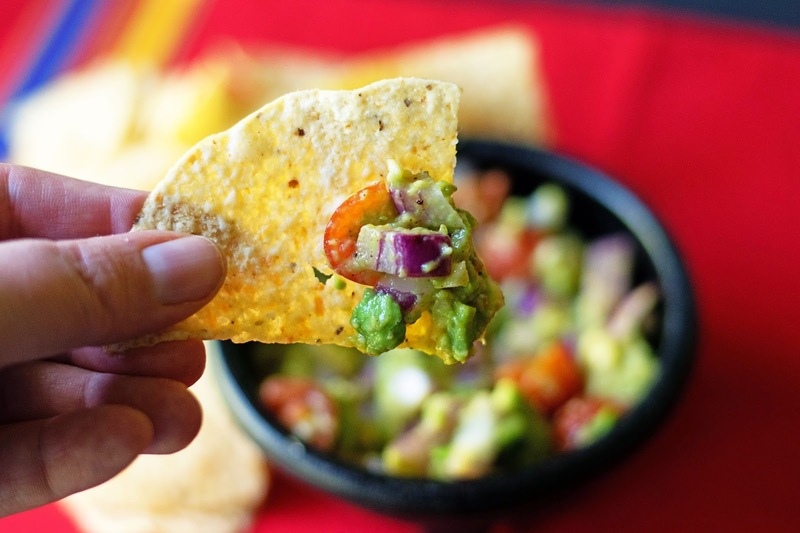 I will never forget the first time I tried guacamole. I was visiting my sister in New Jersey, it was our last night there, and we were going to visit some friends that we had met at her wedding. They are from Costa Rica, and the mother was going to make us a Latin feast! I kid you not, they literally met us at the door with chips and "guac". Before this, the only guacamole I had seen was green, mushy, and unappealing looking. However, her guacamole was chunky, colorful and vibrant. Then I tasted it. OH MY STARS! It was absolutely delicious! Of course I asked for her recipe and I can't wait to share it with you. To begin, quarter your cherry tomatoes and place them into a large mixing bowl. I used cherry because that is what I had on hand, but if I was buying tomatoes specifically for this recipe, I would have used Romas. Now add the diced onions to the mixing bowl. Mince the garlic and add that to the bowl. Now it is time to prepare the avocado. I know that there are a lot of ways to tell if your avocado is ripe, but by technique is to simple squeeze it. If there is a little bit of a give, but not mushy, it is good. To open it, take you knife and press into the side of the avocado until you hit the pit. Then gently run your knife around the outside of the pit, all the way around. Next give each side a little twist and open it up. Give it a little twist and throw it out. Nice to dice the avocado. Take your knife and cut vertical sliced in the skin. You will see the cubes in the skin. Now take a spoon and scoop out the cubes of avocado. Place the avocado into the mixing bowl. And squeeze the lime juice over it. 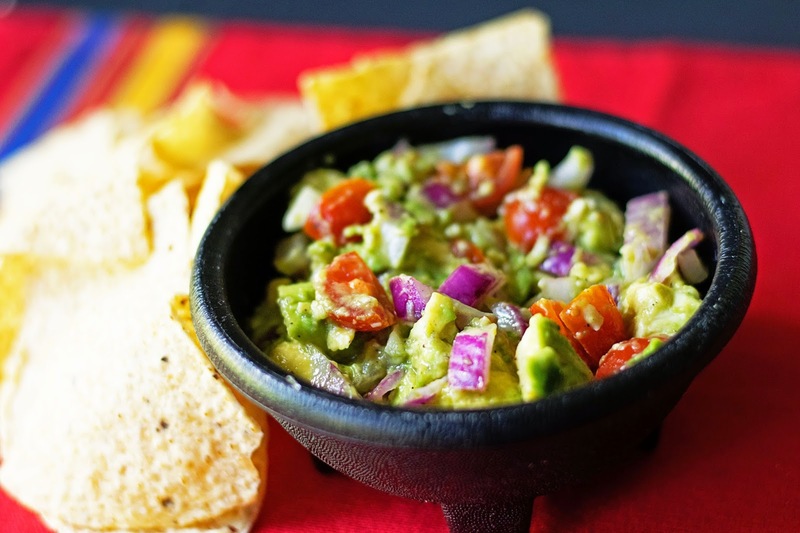 The lime juice not only flavors the guacamole, but it keeps the avocado from turning brown. Give it all a stir and you are ready to go! I love how this guacamole is chunky and you can see everything that is in it. 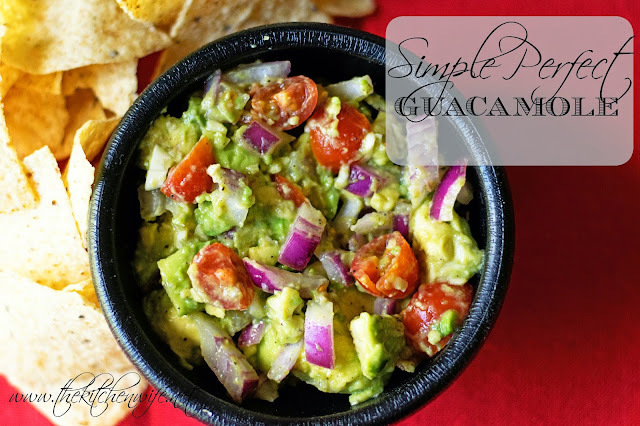 So for this years Cinco de Mayo celebration you DEFINITELY need to give this Simple Perfect Guacamole a try! Now excuse me while I dig in! In a large mixing bowl combine the tomatoes, onion, and garlic. Next add the diced avocado.